One of the curiosities of studying American Orthodox history is that a number of the “firsts” are largely unknown. Matthew Namee has done a lot of work in introducing the first black Orthodox priest in America, Fr. Raphael Morgan. With this post, we’re going to look briefly at the first convert bishop in Orthodox America, Ignatius William Albert Nichols. Never heard of him? It’s probably because his time as an Orthodox bishop lasted just about ten months (more or less). It’s probably also because the vast majority of information about him available is regarding his career as an episcopus vagans, which bracketed his brief stint within Orthodoxy. William Albert Nichols (b. Cambridge, Mass., Dec. 4, 1877) started out his ordained ministry as an Episcopal deacon in 1908 in Arkansas, having received theological education at Union Theological Seminary in New York. He was ordained as an Episcopal priest two years later in Colorado and also trained and worked as a chaplain and journalist, eventually becoming religion editor for the New York Sun and the Brooklyn Standard Union (1926-28) and later The New York World-Telegram (1929-43). He served as an Episcopal parish priest in Brooklyn for two years (1927-29). Things were going fairly “normally” up until he decided to leave the Episcopal priesthood and was in 1929 consecrated as a bishop of the so-called “American Catholic Church” by Bp. Arthur Edward Leighton. Someone must have told him that his orders were “invalid,” however, because in 1930, he was ordained again to the priesthood and consecrated again to the episcopacy, though this time by Abp. 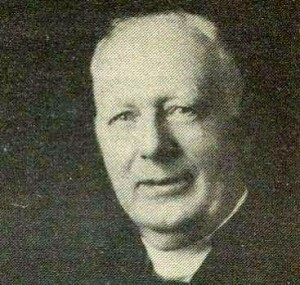 Samuel Gregory Lines of the “Apostolic Christian Church.” Sometime between 1930 and 1932, he became interested in Orthodoxy. From the sources I’ve read (mainly secondary), it’s not clear when Nichols was received into Orthodoxy or by whom. But we do know that in 1932, he was part of the American Orthodox Catholic Church under Abp. Aftimios Ofiesh, probably having founded with Aftimios in 1931 the Society of Clerks Secular of St. Basil. The AOCC was at that time of questionable canonical status, though it had been founded in 1927 with the blessing of the Russian Metropolia in America (itself of questionable canonical status since 1924, when it declared itself independent of its mother church). By 1932, though, Aftimios had made multiple enemies within the ecclesiastical world, as well as suffering the (rather quick) withdrawal of the support of the Metropolia. Despite its isolation, it seems that communion was not broken between the AOCC and other jurisdictions (though Platon in 1930 did say that Aftimios was no longer a Metropolia bishop but a bishop in another jurisdiction), and clergy were readily received from it (typically back into the Metropolia). In any case, by 1932, the AOCC had few parishes. Aftimios’s general vision was modeled on that of St. Tikhon, who attempted to form a multi-ethnic jurisdiction under the Russian archdiocese, with bishops for each ethnic group. Aftimios likewise appointed bishops for the Syrians (Sophronios Beshara and Emmanuel Abo-Hatab, St. Raphael’s former archdeacon) and Ukrainians (Joseph Zuk). He also attempted to appoint a bishop for the Russians, one Fr. Leonid Turkevich (whose consecration as such had been specifically blessed by the Metropolia at the founding of the AOCC, but the blessing was later withdrawn). The last bishop whom Aftimios consecrated was William Albert Nichols, who took the name Ignatius. The consecration took place on September 27, 1932, and Ignatius was appointed as Archbishop of Washington and auxiliary to Aftimios, specially charged with evangelizing “Americans” in English. Ignatius’s work with the Western Rite via the Society of Clerks Secular of St. Basil continued with him as its bishop. Thus, Ignatius is also history’s first (and so far, only) modern Orthodox bishop solely dedicated to the Western Rite. Clearly inspired by his former primate, in July, Ignatius himself married a woman named Emily Chasman. In November, Sophronios declared Ignatius deposed from the episcopacy. Totally isolated from even the fringes of Orthodoxy, Ignatius nevertheless continued his work with the Clerks Secular. He functioned independently until the time of his death in 1947, consorting with multiple episcopi vagantes along the way (even briefly going into communion with John Kedrovsky and his son Nicholas of the Soviet “Living Church”). During this time, he (often with other episcopi vagantes) consecrated six different men to the episcopacy. One of these men was Alexander Turner, who in 1936 took over headship of the Clerks Secular. From 1959-61, Turner succeeded in bringing many of his flock into the Antiochian Archdiocese, thus founding the Antiochian Western Rite Vicariate. Through Ignatius, there are now dozens (perhaps more) of lines of episcopi vagantes who trace themselves back to Aftimios. [*]“Marriage Wins Bishop’s O.K.,” Wilkes-Barre Times-Leader, 10 May 1933, Archives of St. Mary Antiochian Orthodox Church, Wilkes-Barre, Pennsylvania. …the Russian Metropolia in America (itself of questionable canonical status since 1924, when it declared itself independent of its mother church). “Questionable” or “questioned”? “Canonical status” or canonicity and grace of its sacraments? At the time, I believe some local churches had accepted The Living Church as ‘canonical’, which time has shown to be patently untrue. Oddly, to me, mostly the only ones that continue to question the status of the OCA/Metropolia are in ROCOR, which itself was under an even darker cloud of suspicion for most of the last century. A unilateral declaration of independence (which is what the Metropolia did in 1924) is a canonically questionable (and, historically, not just questioned but outright condemned) move in anyone’s book. Both Moscow and the ROCOR (both of which the Metropolia had been part) condemned the move, and for a number of decades, the Metropolia was treated by many Orthodox in North America much the way the Old Calendarists are today (“probably Orthodox, but let’s stay away just to be safe”). They were not, for instance, permitted to be part of the proto-SCOBA Federation formed in the 1940s. It was certainly not a part of what today would be glossed as “world Orthodoxy” (which at the time included some rather shady groups). In any event, to say so is not a judgment on the “canonicity” (not sure what that means as distinct from “canonical status”) or the effectiveness of sacraments, etc. It’s just a recognition of the chaotic canonical situation in America at the time (in this case, the Metropolia specifically). In any event, this is 1924-1932 we’re talking about, so whether anyone “continue[s] to question” the OCA’s status is really beside the point here. That the Metropolia’s independence in 1924 was of questionable canonical status is a matter of history. How one chooses to apply that history to today’s situation is something else. I think a good comparison for the old Metropolia is ROCOR prior to its recent reconciliation with Moscow. In both cases, the groups in question were certainly Orthodox, but their canonical status was irregular. The rest of the Orthodox world wasn’t quite sure how to view them. At the same time, both were viewed as much more legitimate than, for instance, Aftimios’ AOCC, or modern groups like ROAC or HOCNA.